If your computer monitors are faulty, or you have decided to upgrade to modern ones, you may be surprised to know that the disposal of computer equipment is regulated. You just can't just throw your old computer monitors into the trash can with the rest of the rubbish. You need to properly dispose of the monitor in a way that is environment-friendly and meets the rules and regulations in place. Do you have any old or defective monitors taking up your storage space? Don't worry, we at South Bend Junk Removal are here to help you. We can assist you in safe computer disposal Elkhart IN and even in recycling the good monitors. Why is Safe Disposal of Computer Monitors Important? Computer monitors, particularly the CRT ones are known to contain mercury, lead, hexavalent chromium, and cadmium. If disposed improperly, these dangerous metals and minerals may find their way into the soil and water sources, making it unsafe for the environment. To prevent this from happening, you need to ensure that your PC monitor is disposed of in the best possible way. Hiring a computer monitor disposal service makes sure that you or your business is in compliant with the law. Avoid legal issues with the local government by choosing a smart solution to the problem. Take an important step to hire South Bend Junk Removal for safe disposal of your monitor(s). At South Bend Junk Removal, we value the Mother Nature. That's why if you hire us for your monitor disposal services, we strive to ensure that they are disposed in the most environment-friendly manner. As mentioned earlier, monitors have hazardous materials. Trying to dispose of them at your location may be dangerous to you and your employees. If you don't know how to properly dispose of an old computer, we have the expertise and knowledge needed to handle these types of tasks safely. By using a monitor disposal services, your business will remain compliant with the law concerning the disposal of such items. Also, disposing of the monitors is not the only option, we recycle computer monitors! Recently computer disposal has been widened into a more diverse spectrum, and most people are finding that recycling is a useful and environmentally satisfying way to go. We have developed the most efficient procedures for computer monitor recycling. With going green having a significant impact on people's lives, we gear our focus towards recycling rather than standard disposal. Computer recycling is a process that involves protecting our environment from the waste that found in the monitor. 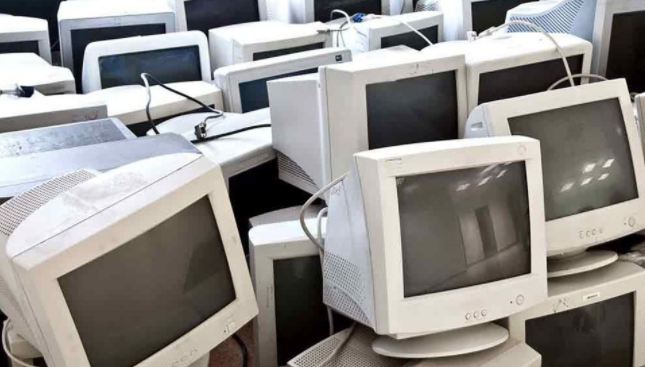 Moreover, recycling gives you the chance to do a good thing for the community because the good monitors may be donated to schools, organizations and other people who can't afford to buy a new one. Where can I recycle a computer? We have the answer. Get in touch with us at South Bend Junk Removal and we will take care of it for you. We will salvage all the useful ones for recycling and safely dispose of the others.